Volkmar Zielasek, Universität Bremen, and Erik Bründermann, Ruhr-Universität Bochum, both senior scientists, reunited after 13 years during the ANKA/KNMF User Meeting 2010 in Karlsruhe, Germany. The last time both met during an Alexander von Humboldt Foundation network meeting to prepare as Feodor Lynen visiting researchers in the USA for the following two years. The Alexander von Humboldt Foundation promotes academic cooperation between excellent scientists and scholars from abroad and from Germany. Bründermann with a background in astrophysics and THz technology then at DLR, German Aerospace Center, was preparing to move to Prof. Eugene E. Haller at Lawrence Berkeley National Laboratory while Zielasek with a background in surface science then at the University of Hannover was preparing to move to Prof. Max G. Lagally at the University of Madison (Wisconsin). Both scientists are now affiliated to physical chemistry, one of the very first interdisciplinary research fields since Robert Bunsen and Gustav Kirchhoff collaborated in the 1850s. 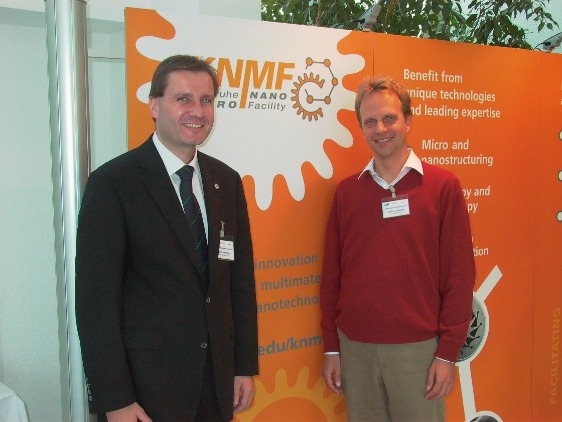 Zielasek and Bründermann use the KNMF facilities for their respective research in nanoscience and nanotechnology. At the KNMF User Meeting, Zielasek discussed "Electron Beam-Induced Nanoparticle Formation in Metal Salt-Loaded Block Copolymer Micelles" in which he used the TEM facility of KNMF, and Bründermann presented his project "Metamaterials for Shaping Synchrotron Radiation in Space and Time" using LIGA synchrotron based technology. KNMF is a high-tech platform for structuring and characterizing a multitude of functional materials at the micro- and nanoscale and serves as an excellent host for their research activities.